EDITED: Due to a ton of confusion, I'm moving the blog back to www.indecoroustaste.com. (But you can still get here via indecoroustaste.blogspot.com.) The site is now located at www.id-taste.com. I hope this will make things easier! In case you've been wondering what project has swallowed me alive for the past month, I've been prepping for the launch of an (IN)DECOROUS TASTE site and shop. The site will be located at indecoroustaste.com, and it'll be a more organized place to keep images of my work, along with a continually updated selection of pieces I'll make available for sale. Guess what? It's ready, finally, and will be up on Monday Tuesday for orders. Because it was important to me that everything be perfect, I'm starting small and launching an edited down collection of 6 harnesses. It's been a trip, just sourcing materials to find the best quality hardware and leather imaginable (I practically live in a heap of leather!)... prepping the site, photoshooting, ironing out all of those pesky incidentals. But yeah, you can now rest assured that the leather is gorgeous and the brass hardware is lush, and the straps are long enough to wear them on...anything. 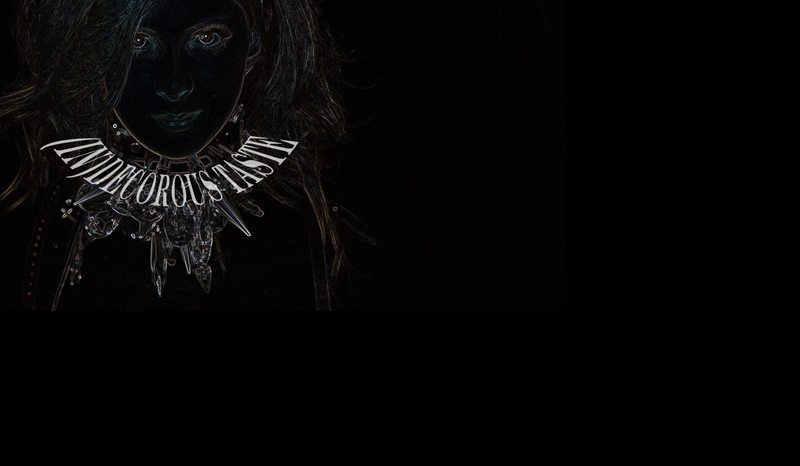 Also, the crystals are plexi so that they don't shatter when you wear them. You'd never know by looking at them or even feeling them though, I swear. I love the (I)D, it looks so good. Great work! Now, we'll have to celebrate with Manhattans! you know I'm like dying right now. I wanted to bite yer idea and do my own crystal and spike harness, but thats kinda lame right? It's probably cooler (and more respectful) to buy yer idea, cuz uh yeah, its srsly amazing. Woo, I know whut I'm asking 4 for christmas. Congrats! it looks great! Cant wait. Good to see you go for it! Bonne chance. I am marking this date on my calender, seriously....i cannot wait any longer! Soo excited! Creativity doesn't visit the lazy - and your the proof in the pudding. Well done. Happened to come across your site today. Looking forward to your site launch tomorrow!! Love your creativity with the shoes and chokers!! I've been looking for the rugged punk look with a feminine edge! Ooo! 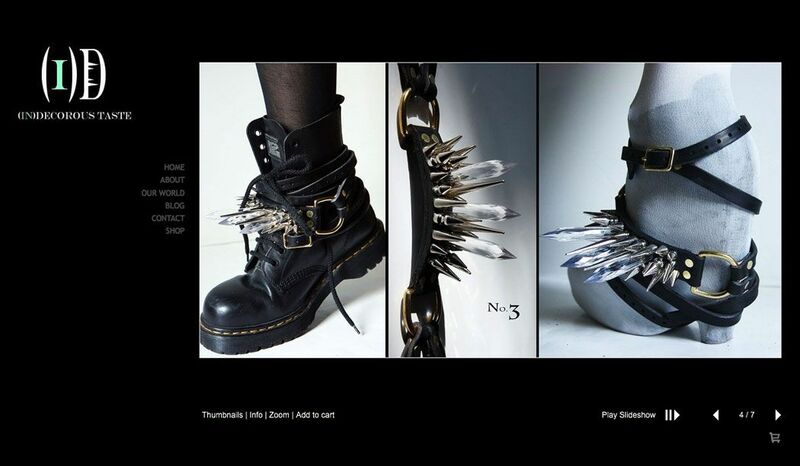 Crystal spikes & metal ones, the punk and the decadence go so well together, I WANT! Alas, for the brass, warm tones and I disagree.